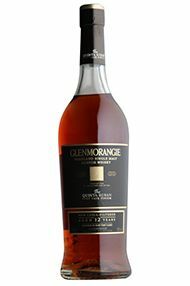 Glenmorangie is the best-selling malt whisky in Scotland and the distillery sits at the banks of the Dornoch Firth, near the village of Tain, Ross-shire. The setting is very much a little ‘glen of tranquillity’, as the translation from the Gaelic describes it. The staff comprises the ‘Sixteen Men of Tain’ who make the whisky and they are featured in the company’s advertising; all are local celebrities. Licensed activity began in 1843 with the conversion of a brewery by William Mathieson. When the distillery was first set up, rather than go to the expense of buying new stills, the distillery manager purchased second-hand swan necked stills that had been used in a gin distillery. These stills are particularly high at 5.14 metres tall, the tallest in Scotland. The ‘boil pot’ each of them has – a bulge below the neck of the still which ensures that only the lightest, finest alcohols pass over in distillation. These unusual stills along with water from the Tarlogie Spring help to give Glenmorangie its unique flavour. 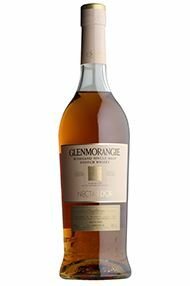 In the 1990s Glenmorangie started experimenting with different wood finishes for their whiskies. As well as the traditional use of casks that had been previously filled with Sherry, they also experimentd with casks from Port, Madeira and even one that had been previously used for Hermitage in the French town of the same name, Tain! 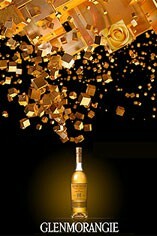 Glenmorangie Quinta Ruban is a velvety-textured single malt whisky. It matures in ex-bourbon casks and then it is finished in port pipes, shipped from the Quintas or wine estates of Portugal. Maturation in Ruby Port pipes develops the Quinta Ruban into a voluptuously smooth spirit with a complex balance of sweet and and dry flavours that engage the entire palate and envelope it in an intriguing balance of smooth velvet and crisp, cooling texture. The Nectar D'Or is Glenmorangie's delicious, complex base spirit, that after maturing in ex-bourbon casks, it is then extra matured in specially selected Sauternes wine barriques. 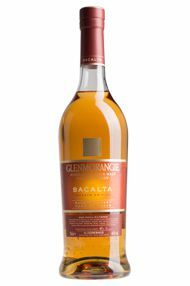 This results to a rich and sumptuous whisky, with a heady, luscious spectrum of flavours reminiscent of patisserie deserts. Its key flavour notes are lemony and syrupy.